Mitt Romney is still in the running to become secretary of state, President-elect Donald Trump revealed Wednesday during a live phone interview on TODAY. "Yes he is," Trump said in his first TODAY interview since winning the presidential election last month. "No, it's not about revenge. It's about what's good for the country. And I'm able to put this stuff behind us," he said when asked if the delay was meant to punish Romney, a man with whom he often sparred. Trump has been busy filling in members of his Cabinet. He has nominated candidates for half of the positions, including Treasury, Defense Secretary and Attorney General, but still is weighing individuals for other key roles, particularly to lead the State Department. 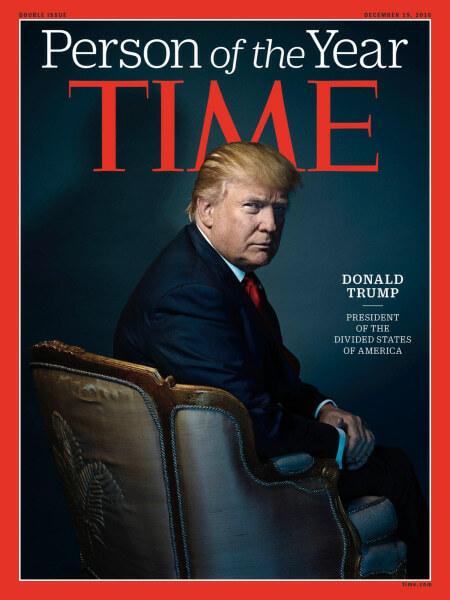 Earlier in the broadcast, TIME revealed Trump as its Person of the Year for 2016. The cover will be Trump’s 10th time on TIME. All but one have been since August 2015. His first appearance on TIME was in 1989. "It's a great honor. It means a lot," Trump said, although he took issue with the magazine calling him "President of the Divided States of America" on its cover. "I think putting divided is snarky. I’m not president yet, so I didn’t do anything to divide," he said. In the wide-ranging interview, Trump addressed his views on free trade and recent criticism of Boeing’s pricing for its jets. When asked about his campaign promise to be more restrained on social media if he were to win the election, Trump insisted he has shown more control — despite targeting the Broadway cast of “Hamilton,” the New York Times, the media and "Saturday Night Live." “I think I am very restrained, and I talk about important things,” he said. Trump said because of the tens of millions of people who follow him on both Twitter and Facebook, expressing his opinions on social media is an efficient way to express himself. “That’s a modern day form of communication. I get it out much more faster than a press release. I get it out much more honestly than dealing with dishonest reporters,” he said. Trump also took to his favorite punching bag, Saturday Night Live, describing the show’s portrayal of him “mean spirited” and the criticizing the overall quality of the program. “I hosted SNL when it was a good show but it’s not a good show anymore,” he said, referring to his appearance just last year on the program. When asked by TODAY's Matt Lauer why he can't simply stop watching the show, Trump continued to disparage the program's work. “The way the show is going now and you look at the kind of work they’re doing, who know how long that show is going to be on. It’s a terrible show," he said. Lauer, in a reference to the history of "SNL," which actually has enjoyed some of its most favorable ratings and reviews recently, responded by telling Trump: "I think it’s going to do okay." Although the president-elect hosted the program only a year ago, he has blasted the show recently in a series of tweets taking aim at the way he's been portrayed by Alec Baldwin. On Wednesday, during an interview with TODAY’s Matt Lauer, Trump even suggested the long-running program's days may finally be numbered. He also specifically targeted Baldwin’s pouty, bumbling take on him. “I like Alec but his imitation of me is really mean-spirited and not very good,” he said on TODAY. When Lauer suggested it might be better for him to just stop watching the program, Trump continued to disparage the show’s work and even suggested it faces cancellation. SNL premiered on NBC in 1975 and has been a weekly staple for the network ever since.